There is more information available on this subject at Matt Forbeck on the English Wikipedia. 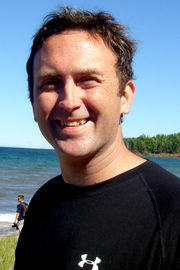 Matt Forbeck (born August 4, 1968) is an American game designer and author of the short novel Halo: New Blood, Halo: Legacy of Onyx, Halo: Bad Blood, and Lessons Learned‎, one of the short-stories in Halo: Fractures. He is a self professed Halo fan after visiting Bungie in 2000 and seeing a pre-development version of Halo.